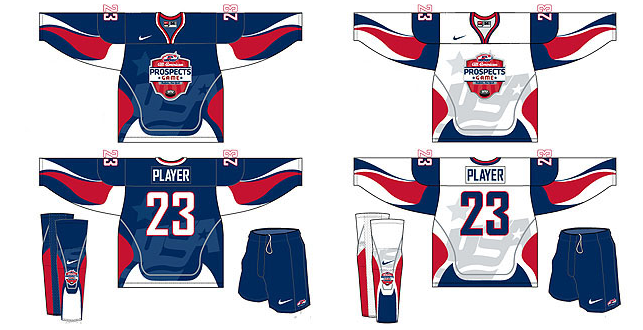 Poll: What are your thoughts on the All-American Prospects game uniforms? USA Hockey released the design of the uniforms for the All-American Prospects game that will be played at First Niagara Center on September 29. The uniforms, designed by Nike, have quite a bit going on. To say the least. I don’t hate them. In fact, the white looks pretty sharp thanks to the red and blue accents. However, the blue uniform has a nice Pro Beach Hockey, RHI, minor-league feel to it. I think the watermark/sublimated USA Hockey logo that is set to the background of each pops more on the blue uniform, making it a little more busy. My only question is in regard to Nike making the jerseys for a CCM sponsored event. I know there are whispers of some hockey companies (CCM, Reebok, The Hockey Company etc.) being purchased. I just wonder if this represents one of those deals. But enough about what I think. Share your thoughts in the comments and on the poll below.